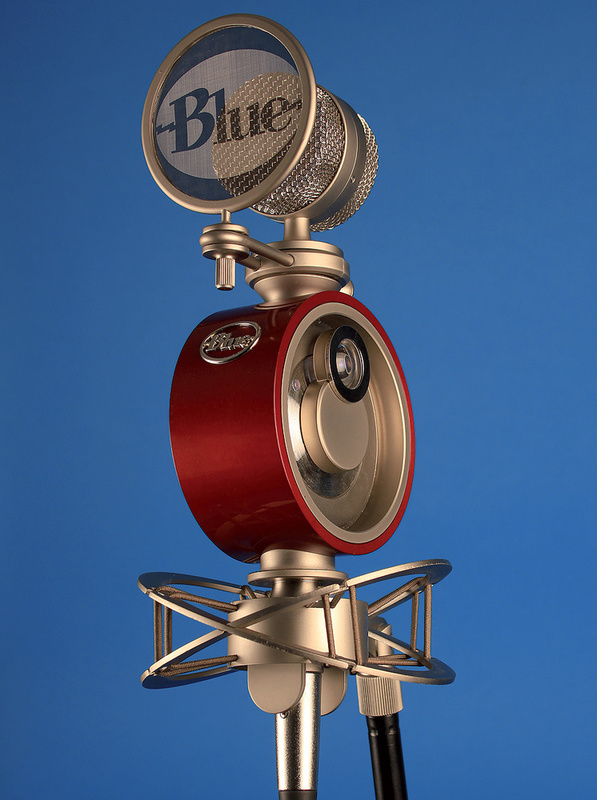 Blue's new Reactor is certainly eye-catching, but does it sound as good as it looks? 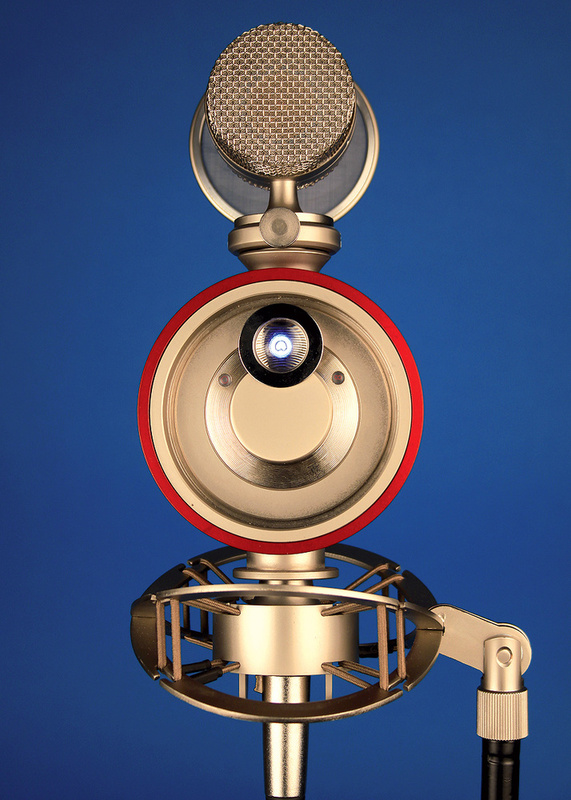 It might look like an instrument for navigating by the stars, but this is in fact Blue's new dual-capsule, multi-pattern microphone, the Reactor. Despite its impressive outward appearance and seriously solid build, the Reactor is fairly modestly priced. It also boasts an impressive set of technical specifications. Blue tell us that the Reactor shares much of their Kiwi model's fidelity and sonic character, though it offers only the three basic pickup patterns — cardioid, omnidirectional and figure-of-eight — while the Kiwi offers a choice of nine. The Reactor has an especially stylish method of pattern selection, involving LED back-lighting and a magnifying lens. The lens rotates around a pivot to three possible positions corresponding to the different pickup patterns, whereupon the selected pattern is illuminated, and visible through the lens. A pair of Reactors can be used for stereo recording, for example as spaced omnidirectional mics, coincident cardioids or as a Mid/Side pair (with one set to figure-of-eight, facing sideways, and any of the three patterns used on the Mid mic). A novel swivelling capsule head allows the basket to be rotated through 90 degrees, making it easy to set up coincident arrangements using a pair of the mics. The swivelling head has enough friction to keep it in place once set. The capsule itself, which is centre terminated, is based on Blue's B6 model. Circuitry throughout is Class-A and uses discrete components. No pad or low-cut filter is included. The Reactor comes with a custom shockmount and a small mesh pop-screen. The latter has a magnetic fastening yoke, making it simple to fit, and it seems very secure in use. The mic and its accessories come shipped in an aluminium storage case. On a practical note, while the shockmount is adequately robust, you need to make sure the thumbscrew is well tightened to avoid a case of the droops. A heavy-duty mic stand is also recommended to avoid toppling. At 2.2lbs, this mic could double as a weapon! Fitting the mic 'capsule up' makes the shockmount somewhat top-heavy, with the mic wobbling around like a jelly on a plate until it settles, so inverted mounting may be preferable. The Reactor, with its basket assembley rotated. The pickup-pattern selector is set to cardioid, with the illuminated cardioid symbol showing through the magnifying glass. The Reactor's frequency response is quoted simply as 20Hz to 20kHz, but you have to look at the rather small printed graphs to find the whole story. There, a presence boost is evident, but it is fairly subtle, and high enough up the spectrum not to provoke harshness issues in most applications. There's a gradual low-frequency roll-off below 200Hz or so, which counters the proximity effect in cardioid and figure-of-eight modes. The mid-range is essentially flat from there on up, until the presence hump kicks in at between 8kHz and 15kHz. As with most multi-pattern mics, the frequency response changes a little between patterns and, of course, the proximity effect also changes, being strongest in the figure-of-eight mode and non-existent in omni mode. Sensitivity is quoted as 19mV/Pa at 1kHz, while the maximum SPL (for 0.5 percent THD) is 135dB. The self-noise is a commendably low 9.3dB (A-weighted), giving a useful dynamic range of 128dB and a signal-to-noise ratio of some 88dB. Standard 48V phantom power is needed for operation. Blue seem to recommend the mic for just about any application, and they're not far off the mark, as it delivered perfectly usable results on everything I tried it with. It has a slightly bright character, which is what gives it such an open and detailed sound, but a couple of dBs of EQ dip easily tames this if necessary. Because the presence peak is fairly high up the audio spectrum, the tonal impression is mainly of airiness rather than of harshness. On vocals, it's the usual story: any mic will suit some voices better than others, and this one gives voices something of a forward quality, helping lift vocals out of a mix. In many cases, this will be a benefit, but some singers can sound a touch over-assertive in the upper mid-range through this mic, bringing out a 'barking' vocal quality in the worst case. Acoustic guitar came over as full-sounding and lively, and my hand percussion test demonstrated that the mic is very happy dealing with transients. It also worked better than many capacitor mics do on electric guitar, delivering a nice bite to the sound, but without sounding thin or harsh. As the presence bump is broad and not too high, the mic responds well to EQ. For my comparative audio files, I made some recordings using the Reactor and also with the Audio-Technica AT4050, which falls into the same price range. The AT4050 sounded a little warmer, as it has less of an obvious presence rise, and on electric guitar I preferred it, but on all the tests both mics produced very workable results. In omnidirectional mode, the Reactor has a clean, open sound. The same is true of the figure-of-eight mode, though you should watch out for that proximity bass boost if you're working close to a source. A single-diaphragm, small-capsule omni mic inevitably sounds more accurate off-axis, but this one still behaves well enough for most practical applications. The Reactor is a capable all-rounder, and very attractively priced for a multi-pattern mic, especially when you consider that it comes with a shockmount, pop-screen and customised aluminium case. Using the shockmount requires a little care because of the sheer weight of this mic, but otherwise the design is as practical as it is eye catching. I like the novel pattern selector, and the swivelling head makes setting up coincident mic arrangements easy, but I would have liked a marker dot on the head to denote the 'front' in cardioid mode. To be fair, though, the manual explains it well enough. I think it's safe to say that, given its price and performance, the Reactor will be a big hit for Blue. If you like unconventional visuals, the Sontronics Helios might appeal to you. Though more conventional in appearance, the Audio-Technica AT4050 and the SE 4400A are also very worthy alternatives at a similar price. Suits a wide variety of sound sources. Swivel head makes it easier to set up coincident pairs. The weight of this mic means you need a sturdy stand. Shockmount is prone to drooping unless tightened very firmly. The dramatically styled Reactor is a capable and solidly designed multi-pattern mic, with a gentle high-frequency lift that adds life and air to vocal and instrumental sounds. 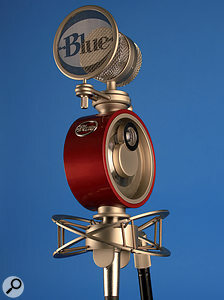 It gives good results on most sound sources making it a worthy choice if you can only afford one mic.